Know of anymore deals like that knocking around? Seek, and ye shall find ! Great deal Paul and the car looks fantastic. Plenty of smiles per gallon there. Paul - what dealer was that WITH? also, that rear wing is adjustable, thats not a standard subaru spoiler is it??? HT Auto's plus front lip as well. As Don says, both the rear wing and front splitter are HT Autos parts. The car was not sourced via a Subaru main dealer. Makes me want to trade the hatch. And then I remember that I bought the hatch for practicality. D'oh! When I first saw the new saloon, particularly those fitted with the rear wing, I knew that I wanted one. I wasn't prepared to pay the £33k that they were asking at the time but now that you see 'nearly new' saloons with a few k on the clock advertised for £10k less, with two years warranty to run. Also I was offered the full 300 to 340 upgrade for £750, the rear wing at half price including spraying and fitting, front splitter thrown in for nothing and £19k for my hatch. The hatch is a brilliant car but I couldn't resist this saloon in what I think is the best colour. If I could find a deal like that on a blue or white 2011MY hatch I would be very tempted to trade in my 18 month old hatch. Anybody know who has a white or blue hatch demo car? Last edited by Don Clark; 02 April 2012 at 09:48 AM. I picked up my 2008MY STi hatch just as the last few new cars were being sold in the UK, in the summer of 2010. 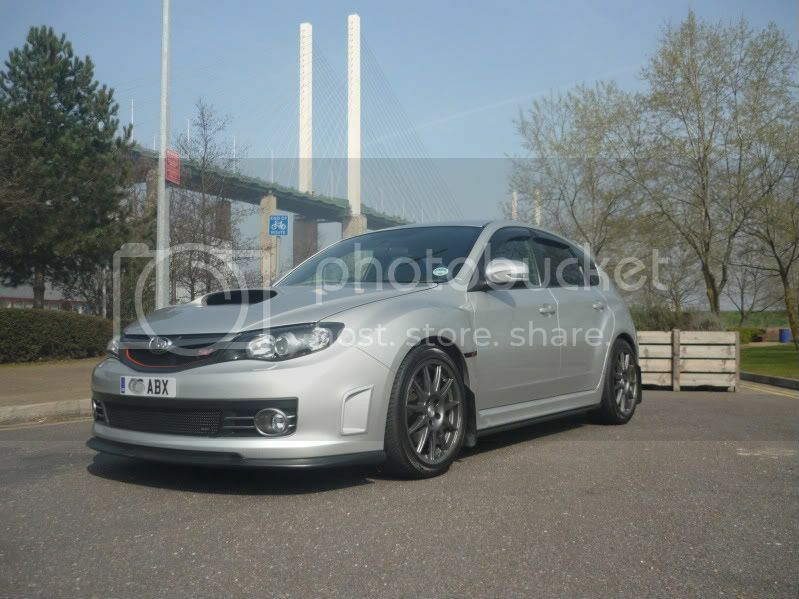 I am a little tempted to look at a 2011MY hatch, the one I have seems to be a little jinxed, also I could get the colour I want either white or blue. How do the two cars compare, obviously Recaros, 18" rims, spec C suspension, keyless entry, pushbutton start, satnav. Anyone driven both models, is the handling any better than the 2008MY? Any reports of MY2011 engines going pop yet? I have had both (hatch then saloon). The handling with the spec C is miles better IMO. I chicken out long before the car does The ride isn't any firmer either. You'll get the 320r upgrade, and no engines have popped as far as I know. I reckon the 320 does a couple of MPG more as well. I don't think I have ever seen a plasma blue hatch for sale? I'm looking for a white one in 3-4 months time but MY11 hatches are rare as rocking horse poop. Everytime I see that one it keeps making me think about changing my front bumper. As for silver, you know is the right choice and fastest colour! Looking great fella, would love the new bumper but invested a fair bit of cash on the front already and starting again I think would just be to expensive, it's already had fogs, splitter, zun mesh and some paint, also to blend a new bumper I'd have to blow in the wings and bonnet, no way I'd get that plus fogs, splitter etc again past the Mrs! Out of interest in case I do what sort of price did all the new parts come in at, parts only without paint or fitting? Cheers buddy, really useful info. Anybody aware of any pro-r deals / offers on the 340r upgrade? Nice Don I want a carbon bonnet with vents how much are they ? SniffmyDiff id be intrested but where is your dealer ? ive got 320R also but not had the 340 done yet as its just too much for me at present. Last edited by Littleted; 29 March 2012 at 05:29 PM. I need a new front bumper after a pheasant committed hari kari under my car, this looks and interesting change, improves the look of the 2008MY front end. Suspension & handling kit from Litchfield. Engine rebuild, with proper internals. 18" alloy with decent rubber. Mmmm easier than convincing the Mrs that I want to trade in an 18 months old car, for to her the same car. As expected, there is no discernable difference in performance between the 330 hatch and the 340 saloon. The saloon has a more 'planted' feel to it and when cornering, the steering isn't as vague, but there is a price to pay in the ride quality. You feel more bumps in the road than with the hatch. The rear wing does slightly hinder vision through the back window when set in the 'up' position. I'll give it a try in the 'horizontal'. The Scorpion system does give the car a deeper, noticably noisier exhaust note than the Prodrive on the hatch. I haven't yet got the hang of the push button start, I keep looking for the key to put in the ignition. Otherwise, like the hatch, it's a fantastic machine for the money. Last edited by paulbu; 01 April 2012 at 11:13 PM. I thought Scorpion made the zorst for Prodrive? Doesn’t the 330s have keyless entry & push button start? I wonder if that's down to the dual back box? Last edited by urban; 02 April 2012 at 09:21 AM.